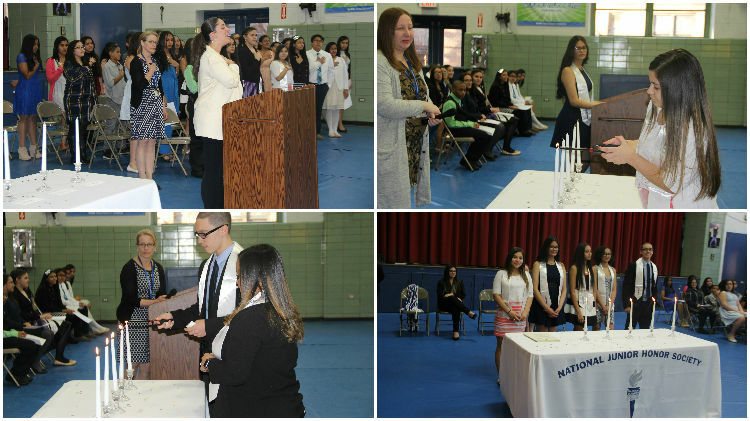 Parents, families, students, faculty, administration and friends of Inwood Academy celebrated scholars at the 2016 National Junior Honor Society Induction Ceremony. The National Junior Honor Society (NJHS) recognizes the highest achieving students. More than just an honor roll, NJHS welcomes students who have demonstrated excellence in the areas of Scholarship, Leadership, Service, Citizenship and Character. “Middle School isn’t easy. There happens to be a lot of distractions! To continuously push yourselves academically and stick with challenges in order to achieve scholarship is quite a feat. You didn’t get here because you’re smarter than everyone else. You’re here because you determined to be here. Josely Jimenez asked me almost every day if her average was where it needed to be to become a NJHS member- even when she had to stay an extra week in the DR! She emailed me consistently to get to get her assignments and ask about her grade point average. Another quality you demonstrate is leadership. Other students follow you not because of your magnetic personalities, but because of the choices you make. Your example in the classroom, cafeteria, hallways and neighborhood is noticed by others. So, leadership that is compelling results from your character, another hallmark of a NJHS member. Your character has led you to understand that right is right, even if everyone else seems to disregard it, and wrong is wrong, even if everyone else seems to think it’s okay. A person of character does not take a poll to determine the right actions. Congratulations to all of our NJHS members and their families. To view more photographs from the ceremony, see our 2016 National Junior Honor Society photo album. May 13, 2019, 4 to 6 p.m.